The limited-edition Challenger SRT Demon was America’s answer to all those hyper-priced hypercars that have been dominating drag strips and high-speed runs around the globe. 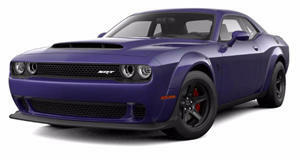 Bolting the world’s largest production supercharger to its 6.2-liter V8 gave it 808 horsepower straight out of the box. Install the power control module and fill it with 100-octane fuel and that figure goes up to 840 hp. It is in this state that the Dodge Challenger SRT Demon lined up at the starting line of the 2.7-mile-long Johnny Bohmer Proving Grounds runway. Designing a car to be the quickest quarter-mile vehicle ever comes with some compromises though, hence the 168-mph limit the factory imposed on all these cars. The massive front air scoop and dragstrip-spec tires are undoubtedly going to be limiting factors in how fast a Demon can go but with 840 hp at its disposal, surely 168mph would register as not much more than a blur on the speedometer. Well, one owner decided to see exactly how fast his car really was and aside from deactivating the speed limiter via the power control module and fitting some more appropriate tires, this 2018 Demon is stock standard. Getting off the line it is clear that the driver was not attempting to break the 9.65-seconds quarter-mile record time but was rather focusing on putting the power down smoothly. Clearly it worked as the factory limit was breached in a mere 23 seconds as the heavy car powered on to an impressive 211mph. After such an impressive display we bet that they could have sold way more than the 3,300 examples that were eventually built. At $84,995, not only were they a massive bargain but also a fantastic investment for those lucky owners.